Happy Friday! 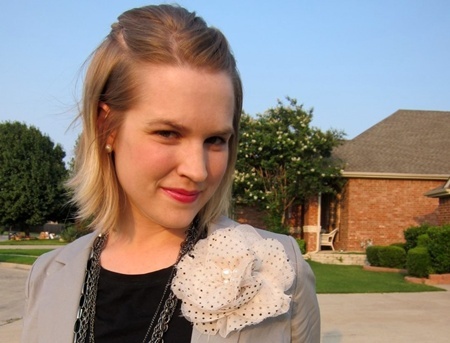 Jenni here from Engineered Style. Thanks for joining me on the last day of John Freida reviews on Splendiferous Inclinations! I blog from the perspective of an engineer, constantly looking for ways to re-engineer my style and life, while meeting the constraints of work on a construction jobsite. I was delighted when Jessica gave me the opportunity to try out this new John Frieda lightening product. My work outfits may require long pants and closed toe shoes, but my hair can be any color, length or style that I please! "Versatile, patent-pending formula with citrus and chamomile works with styling heat to gradually lighten and brighten for a natural-looking, blonder blonde. Contains thermo-protectant. Patent-pending technology combines fixative and conditioning polymers that retain hydrogen peroxide, allowing for control of lightening. Visibly lightens in 3-5 uses." This is easy. Am I crazy, or does my hair already look blonder after just 1 use? Surely the "placebo effect" is taking over. Could it really already be working? It smells faintly of salon highlighting products (the peroxide, maybe?). Whoa. This is easy. I'm not crazy. My hair really does look blonder. Husband agrees. I'm pretty sure if I use this for much longer, my hair is actually going to get too blonde (is that even possible in Texas?). Maybe use it one more day? Done and Done. Roots are blended into the rest of my hair seamlessly. Crazy, right? I'm still stunned. And at around $9, that's a bazillion $$ cheaper than my hair stylist. Plus, I still have quite a bit left in the bottle, so this will last for at least another lightening or two. A few of the online reviewers noted that they had problems with it turning strawberry colored, but all I found was perhaps a warmer blonde instead of a cooler blonde. I may pick up some John Freida Color Renew Tone Correcting Shampoo to see if that cools it off. Or maybe not. It doesn't really bother me, but it's an option. 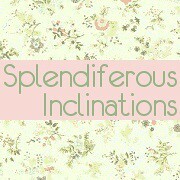 Thanks for joining me here on Splendiferous Inclinations! I know I've enjoyed Jessica's reviews this week, and I'm sure we're all looking forward to the giveaway too! I hope you'll come say hello to me again sometime over at Engineered Style! End Note: I was already using the John Freida Go Blonder Lightening Shampoo and the Go Blonder Lightening Conditioner, but since they don't contain any peroxide, they are supposed to have a more gradual effect on hair color. I was only using them for a week before I tried the spray, but I'm excited to see if they help maintain or enhance the color throughout the summer. Stay tuned! The John Frieda giveaway will be going up later today, and you'll have the chance to win the Controlled Lightening Spray and 5 other John Frieda products! @Roxiita Guzman Jenni did a great job!